ExxonMobil and Synthetic Genomics Inc. today announced a breakthrough in joint research into advanced biofuels involving the modification of an algae strain that more than doubled its oil content without significantly inhibiting the strain's growth. Using advanced cell engineering technologies at Synthetic Genomics, the ExxonMobil-Synthetic Genomics research team modified an algae strain to enhance the algae's oil content from 20 percent to more than 40 percent. Results of the research were published today in the peer-reviewed journal Nature Biotechnology by lead authors Imad Ajjawi and Eric Moellering of Synthetic Genomics. 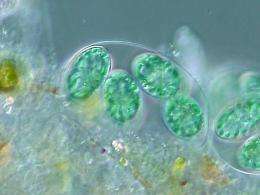 Researchers at Synthetic Genomics' laboratory in La Jolla discovered a new process for increasing oil production by identifying a genetic switch that could be fine-tuned to regulate the conversion of carbon to oil in the algae species, Nannochloropsis gaditana. The team established a proof-of-concept approach that resulted in the algae doubling its lipid fraction of cellular carbon compared to the parent – while sustaining growth. "This key milestone in our advanced biofuels program confirms our belief that algae can be incredibly productive as a renewable energy source with a corresponding positive contribution to our environment," said Vijay Swarup, vice president for research and development at ExxonMobil Research and Engineering Company. "Our work with Synthetic Genomics continues to be an important part of our broader research into lower-emission technologies to reduce the risk of climate change." "The major inputs for phototropic algae production are sunlight and carbon dioxide, two resources that are abundant, sustainable and free," said Oliver Fetzer, Ph.D., chief executive officer at Synthetic Genomics. "Discoveries made through our partnership with ExxonMobil demonstrate how advanced cell engineering capabilities at Synthetic Genomics can unlock biology to optimize how we use these resources and create solutions for many of today's sustainability challenges – from renewable energy to nutrition and human health." "The SGI-ExxonMobil science teams have made significant advances over the last several years in efforts to optimize lipid production in algae. This important publication today is evidence of this work, and we remain convinced that synthetic biology holds crucial answers to unlocking the potential of algae as a renewable energy source," said J. Craig Venter, Ph.D., Synthetic Genomics co-founder and chairman. Late News; 1-Day Old. If New Alga is So Great, Why NOT Transfer its characteristics to other Algae Too? Just Split its Genome and transfer bits of it sequentially to other Algae and See What happens ! Why NOT Transfer its characteristics to other Algae Too? They are already using a base algae that is rich in oil. Applying this method on one that is less rich in oil doesn't yield greater benefit.